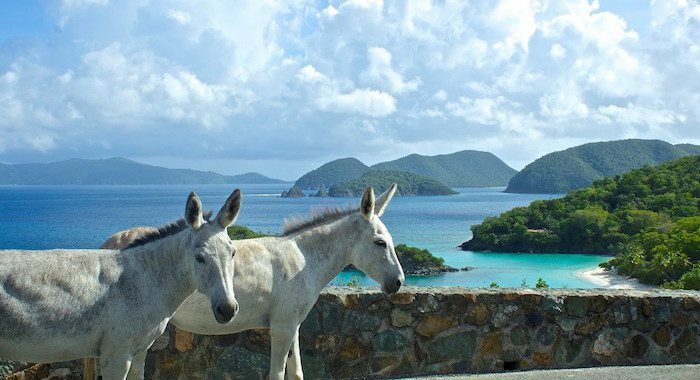 At 7300 acres, Virgin Islands National Park comprises 60% of the landmass of St. John (and bits of the other USVI). There are numerous hiking trails in the park which are also good for running. This route, which mixes paved roads, paths, and waterfront views, comprises Francis Bay as a standalone 3.7 mile (6 km) out and back, or 7.5 km when combined with the Johnny Horn Trail. Start off at Francis Bay, just south of Mary Point in the North of the island. Francis Bay Trail. The Francis Bay Trail starts at the beach to the west. To the east, it runs out to the Annaberg School Ruins and the Annaberg Sugar Plantation where it meets up with the Leinster Bay Trail. This gorgeous path circles Waterlemon Bay for about half a mile. When you reach the end towards Leinster Point, you can reverse back towards Francis Bay for a total of about 3.7 miles (6 km), or continue for an additional mile on the Johnny Horn Trail. Johnny Horn Trail: At the east end of Waterlemon Bay, the Francis Bay Trail connects to the Johnny Horn Trail. This ~1 mile (1.6 km) path runs south to a paved road near the Moravian Church in Emmaus/Coral Bay. It’s a somewhat hilly route, but a decently wide and clear path for trail running, and the views from its many landmarks — including the ruins of a Danish guard house — are incredible. Run it as an addition to the Francis/Leinster Bay Trail, or as an out and back on its own. It is best accessed from the north (Leinster Bay) side.